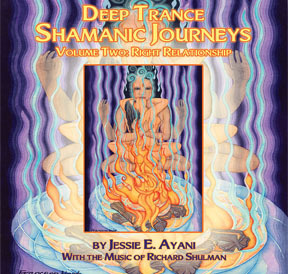 The journeys can be taken with that simple guidance or in conjunction with the spiritual path described in Awakening and Healing the Rainbow Body and the guidance for that path contained in the Awakening and Healing Companion Guide to Self-Mastery (this CD is required to successfully complete that work). Track One: The Journey to Heal Addiction is used as the final step in a complex system for healing addiction that is woven into the rainbow body work in Awakening and Healing the Rainbow Body Companion Guide to Self-mastery. However, it can be taken at any time for an exquisite, if momentary, connection to higher self. Such experiences help to fuel the fire needed to passionately embrace the rainbow body work. Track Two: The Beloved Twin Ray journey gives the listener the opportunity to merge with the energies of their twin ray — the compliment of their Essence — in a profound meditation of union. The first track on the CD is needed near the end of the work in the Companion Guide to Self-Mastery, but both journeys are real gifts at any time — for any path walked on the spiritual quest. ISBN# 978-0-9648763-7-8, Total running time 73' 98".